Penn State » Ag Sciences » Ecosystems » Directory » Mary Ann Victoria Bruns, Ph.D.
Connect with Mary Ann Victoria Bruns, Ph.D.
Research in the Bruns lab aims to gain understanding of soil microbial responses to anthropogenic disturbance and of microbes’ roles in mitigating disturbance effects. Humans are constantly altering the face of the Earth—through forest clearing, urban development, agricultural cropping, strip mining. When soils are subjected to drastic disturbances, their complex biological networks are also disrupted. Well-established interactions among roots, fungi, other microflora, and micro- and macrofauna are all destroyed once vegetation is removed and soil is upturned, buried, or eroded away. Humans have little understanding of the ecosystem services performed by these underground biological networks or the impacts their losses may have (had) on local, regional, and global biogeochemical cycles. We are studying nitrogen transformations in agricultural soils; beneficial microbe-mineral-plant interactions in reclaimed soils; and multi-functional biological crusts on arable soils. We combine molecular, microbiological, biochemical, microscopic, and mineralogical techniques to explore microbe-mineral-plant interactions. A Legacy in the Soil - Follow the story of a young woman who returns to her family's homestead to help clean up soils contaminated by acidic mine drainage. Bruns, Mary Ann. 2016. Bacteria, in Encyclopedia of Soil Science, 3rd ed., (R. Lal, ed. ), Taylor and Francis. Bruns, Mary Ann. 2014. Sustainable soil health, pp. 209-223. In Plant Biotechnology: Experience and Future Prospects. A. Ricroch, S. Fleischer, S. Chopra (eds), Springer International Publishing, Switzerland. Rojas, CR, RM Gutierrez, MA Bruns. 2016. Bacterial and eukaryal diversity in soils forming from acid mine drainage precipitates under reclaimed vegetation and biological crusts. Applied Soil Ecology 105:57-66. Rojas, C, CE Martinez, MA Bruns. 2014. Fe biogeochemistry in reclaimed acid mine drainage precipitates—implications for phytoremediation. Environmental Pollution 184:231-237. Lupton, Mary Kay, Claudia Rojas, Patrick J Drohan, Mary Ann Bruns. 2013. Vegetation and soil development in compost-amended iron oxide precipitates at a 50-year-old acid mine drainage barrens. Restoration Ecology 21:320-328. Machulla, Galina, Mary Ann Bruns, and Kate M Scow. 2005. Microbial properties of mine spoil materials in initial stages of soil development. Soil Science Society of America Journal 69:1069–1077. Moon, J.B, DH Wardrop, MA Bruns, RM Miller, KJ Naithani. 2016. Land-use and land-cover effects on soil microbial community abundance and composition in headwater riparian wetlands. Soil Biol. Biochem. 97:215-233. McDaniel, Marshall D, Jason P Kaye, Margot W Kaye, and Mary Ann Bruns. 2014. Climate change interactions affect soil carbon dioxide efflux and microbial functioning in a post‑harvest forest. Oecologia 174:1437–1448. Martir-Torres, Maina C, Mary Ann Bruns. 2013. Comparative diversity and abundance of ammonia monooxygenase genes in mulched and vegetated soils. Soil Biol. Biochem. 57:758-768. Adviento-Borbe MAA, Kaye JP, Bruns MA, McCoy M, McDaniel MD, and Harkcom S. 2010. Greenhouse gas and ammonia emissions in a long-term rainfed maize-based cropping systems experiment. Soil Sci Soc Am J. 74(5):1623-1634. Byrne, Loren B, Mary Ann Bruns, and KC Kim. 2008. Ecosystem properties of urban land covers at the aboveground-belowground interface. Ecosystems 11:1065–1077. Minyard, Morgan L, Mary Ann Bruns, Laura J Liermann, Heather L Buss, and Susan L Brantley. 2012. Bacterial associations with weathering minerals at the regolith-bedrock interface, Luquillo Experimental Forest, Puerto Rico. Geomicrobiol J 29:792-803. Yoon, Soh-Joung, Carolina Yáñez, Mary Ann Bruns, Nadia Martínez-Villegas, Carmen Enid Martínez. 2012. Natural zinc enrichment in peatlands: Biogeochemistry of ZnS formation. Geochimica et Cosmochimica Acta 84:165-176. Prasanna, Radha, SK Ratha, Claudia Rojas, Mary Ann Bruns. 2011. Algal diversity in flowing waters at an acidic mine drainage “barrens” in central Pennsylvania, USA. Folia Microbiol 56:491-496. Minyard ML, Bruns MA, Martínez CE, Liermann LJ, and Brantley SL. 2011. Occurrence of halloysite nanotubes and bacteria in a granodiorite weathering front, Rio Icacos Watershed, Puerto Rico, Soil Sci Soc Am J. 75:348-356. Buss HL, MA Bruns, MJ Schultz, J Moore, CF Mathur, and SL Brantley. 2006. The coupling of biological iron cycling and mineral weathering during saprolite formation, Luquillo Mountains, Puerto Rico. Geobiology 3: 247–260. Senko, J.M., G. Zhang, G.T. McDonough, M.A. Bruns, and W.D. Burgos. 2009. Metal reduction at low pH by a Desulfosporosinus species: implications for the biological treatment of acidic mine drainage. Geomicrobiology J., 26:71–82. Senko, J.M., P. Wanjugi, M. Lucas, M.A. Bruns, W.D. Burgos. 2008. Characterization of Fe(II) oxidizing bacterial activities and communities at two acidic Appalachian coalmine drainage-impacted sites. ISME J. 2:1134–1145. Martínez, CE, CE Yáñez, SJ Yoon, and MA Bruns. 2007. Biogeochemistry of metalliferous peats : Sulfur speciation and depth distributions of dsrAB genes and Cd, Fe, Mn, S, Zn in Soil Cores. Environ Sci Technol. 41:5323–5329. Luo, Y.H., H. Zhang, M. Salerno, B.E. Logan, and M.A. Bruns. 2008. Organic loading rates affect composition of soil-derived bacterial communities during continuous, fermentative biohydrogen production. Internatl J Hydrogen Energy 33:6566–6576. Zhang H, MA Bruns, and BE Logan. 2006. Biological hydrogen production by Clostridium acetobutylicum in an unsaturated flow reactor. Water Research 40:728–734. Oh S-E, P Iyer, MA Bruns, and BE Logan. 2004. Biological hydrogen production using a membrane bioreactor. Biotechnol Bioengineering 87:119–127. Kim, J.R., J. Dec, M.A. Bruns, and B.E. Logan. 2008. Removal of odors from swine wastewater by using microbial fuel cells. Appl. Environ. Microbiol. 74:2540–2543. Wheeler, EF, PA Topper, RE Graves, MA Bruns, and C Wysocki. 2007. Odor reduction performance of constructed wetland treating diluted swine manure. Applied Engineering in Agriculture 23(5):621–630. Castillo-Gonzalez HA and MA Bruns. 2005. Dissimilatory iron reduction and odor indicator abatement by biofilm communities in swine manure microcosms. Appl. Environ. Microbiol. 71:4972–4978. Rosen, G.L., B.A. Sokhansanj, R. Polikar, M.A. Bruns, J. Russell, E. Garbarine, S. Essinger, N. Yok. 2009. Signal processing for metagenomics: Extracting information from the soup. Current Genomics 10:493-510. Turich, C, KH Freeman, MA Bruns, M Conte, AD Jones, and SG Wakeham. 2007. Lipids of marine Archaea: Patterns and provenance in the water-column and sediments. Geochim Cosmochim Acta 71:3272–3291. Zhang, H, Logan BE, Regan JM, Achenbach LA, Bruns MA. 2005. Molecular assessment of inoculated and indigenous bacteria in biofilms from a pilot-scale perchlorate-reducing bioreactor. Microbial Ecology 49:388–398. Yonghua Luo, Ph.D. Soil Science (2008), USDOE National Renewable Energy Laboratory, Golden, CO; now at Abeome, Athens, GA.
Loren Byrne, Ph.D. Ecology (2006), Assistant Professor of Biology, Roger Williams University, Bristol, RI; now Associate Professor. Hugo Castillo, Ph.D. Ecology (2005), Facultad de Zootecnia, Universidad Autonoma de Chihuahua, Mexico; now at New Mexico State University. 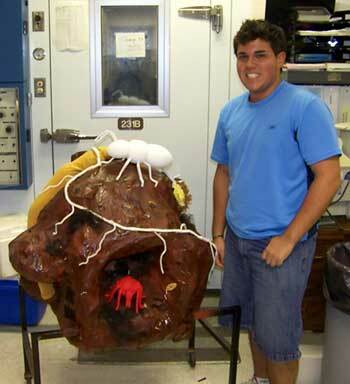 Summer lab visitor Bernie Martir, who is an undergraduate engineering student at University of Puerto Rico-Mayaguez, made needed renovations on ‘Claude the Clod’, our 4000x scale model of a soil macroaggregate with its associated organisms. Thanks to Bernie’s engineering and artistic talents, Claude now sports much more realistic depictions of the springtail and mite, members of the two most abundant microarthropod groups in soils. Thanks, Bernie!